Who am I? Why Should You Listen to Me? Who am I? Why Should You Listen to Me? @ m i c h e l l e jl e v i n e How c an we How c an we a void div soup? a void div soup? @ m i c h e l l e jl e v i n e C an I St art C an I St art Today? Today? t o -fle x b o x /fle x b o x f ro g g y . c o m / b e n n e t t f e e l y . c o m /fle x p l o re r/ More Fle x box! More Fle x box! pri m i t i v e s .
grid-template-areas : "a a a"
http:/ /labs.jensimmons.com/2016/ e xamples/ spices-1.html @ m i c h e l l e jl e v i n e No More No More Media Querie s? Media Querie s? @ m i c h e l l e jl e v i n e Grid or Fle x box? Grid or Fle x box? h t t ps : / / r a c h e l a n d re w . c o . u k / a rc h i v e s / 2 0 1 6 / 0 3 / 3 0 / s h o u l d -i -u s e -g ri d -o r-fl e x b o x / or floats?? @ m i c h e l l e jl e v i n e Re al E x ample s Ple a se! Re al E x ample s Ple a se! View Modern Layouts: Flexbox, CSS Grid, and Beyond on Notist. Part into, part history lesson, part workshop. This talk introduced the audience to CSS Grid and Flexbox and helped them dig in and get started with the code. Want to learn how to use CSS Grid? Catch me at 1 of 3! workshops this month! There will be a practice version with #FreeCodeCamp (7/9), a version focused on Modern Layouts in React with @WWCodePortland (7/11), and a deep dive hands-on workshop with @frontendpdx (7/17). 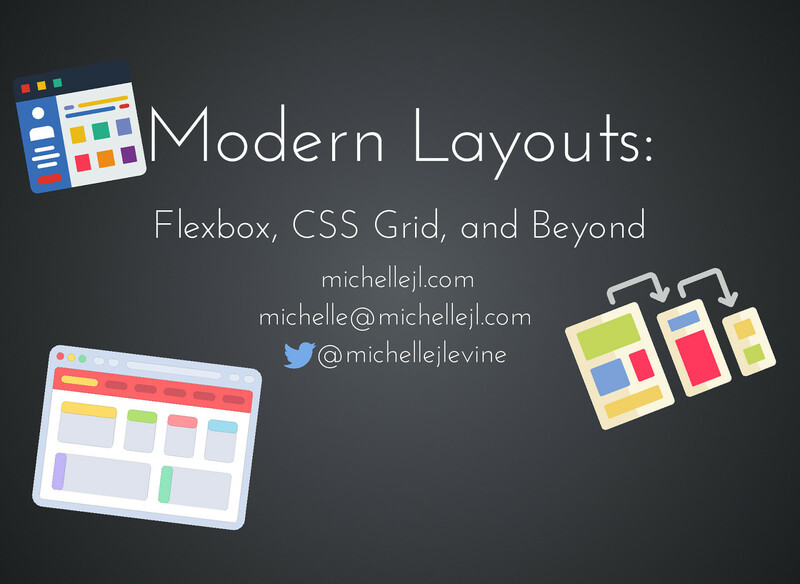 Thanks @MichelleJLevine for a great presentation on #cssgrid and #flexbox! 🖥️🖌️ Learned a lot! And thanks @frontendpdx for hosting! Well structured grid css examples from @MichelleJLevine.